‘Hello World’, the maker community world! Here’s a post on #FirstThoughts, #3DPrinting and #LifeExcitement. Blog post #1 on making things and the super fun stuff that’s related. Stepping into the MakerLab, it’s like a kid arriving in a candy shop. I’m an engineering student who’s just been given the tools to make ideas a reality. There’s a blank canvas and so many possibilities. The chance to follow any train of thought, develop them into ideas, and have the resources and time to create them is quite a luxury. On the subject of candy shops and 3D printing, 3D printed candy is a thing too! Surrounded by a room of Ultimakers buzzing away, the excitement is unreal. Yet, 3D printing is old tech. The concept is, anyway. The impression I get is that the forward development of this technology is in creating higher resolution prints, printing in materials other than common PLA and ABS (their mechanical properties are not suited for the more intensive practical applications), increasing print speed, and even combining different materials as they are being printed. From the class skype call with John Hornick, book author of “3D Printing Will Rock the World“, he mentioned possibilities of printing in materials with dual/multiple functionality. While 3D printing is paving the way and bringing us closer to a single machine that could create entire multi-material devices like, for example, a smartphone, this technology is still a very long way off. Multifunctional materials were mentioned as a feeder material into 3D printing machines, but having spent my last semester studying research papers on multifunctional materials, am fairly certain that it’s still rather far off. On the other hand, maybe I’ve underestimated quite how far we’ve come in the realm of 3D printing? I guess I’ll just have to read John’s book for a fuller picture. Where does this leave us with 3D printing then? There’s definitely much scope for research and development from the materials perspective. As a current tool in “making” or creating things, it’s a good prototype, and good for small parts that do not have to withstand aggressive or cyclic structural loading. Complex (and beautiful) shapes are possible, but I wouldn’t say we’re 3D printing items that I’d be happy to seamlessly integrate into my everyday life yet. 3D printed from glass powder, there’s some very artistic designs you can create. So what are my own goals with regards to 3D printing? Getting involved in the printer material research that will bring about these futuristic ambitions, or/and using that current technology to make small projects and ideas possible. The real beauty of what we have so far (in terms of 3D printing) is that there are so many possible items and devices to make, which are completely within reach of the average you and me. Looking to the future, we’ll be 3D printing biological structures and mechanical devices on demand. For now though, I’m happy to settle with any shape I want, at the push of a button, right here right now. One of UIUC Makerlab’s Ultimakers in action. The Digital Making Seminar was the last thing I expected to take this semester. I thought my last four months here would be absorbing semi-new knowledge about my major and minor from a traditional educational system. How I found myself picking this class is a blur to me. 3D printing is a technology I have seen on the internet in videos and articles since 2010, and from last week’s class, knowing that this technology has been around for three decades fascinated me. I honestly thought, prior to this that the 3D printing technology would be something of a consumer-based fad that would die out in the next five to ten years. John Hornick’s lecture opened my eyes to the facets of this technology and how versatile its applications are. Prosthetics, musical instruments, even food products are either being made and the industries are on the verge of partaking in the transition towards industrial 3D printing. I’ve learned from John’s lecture how beneficial 3D printing can be for many industries, and how potentially disruptive this tech can be for modern industry and society, handing the power of production from producers and manufacturers to consumers. I’m giddy with my eyes wide in wonder at how my perspective and skills will transform as I continue with the Digital Making Seminar as the semester progresses. A few of the things I found as I searched for interesting uses of 3D printing are below. One of the most interesting and, in my opinion, unconventional uses I’ve found is how musical instruments have been a focus in 3d printing. First, a 3d printed electric violin, and a piezoelectric violin. The latter was what fascinated me more than anything else because of how the creaters of these piezoelectric instruments, Monad Studio,are essentially using properties of different materials to modify how musical instruments work. While searching for articles, I discovered this. Being able to 3d print a layout of dark matter in our galaxy, something that is still unobservable for us humans, blew my mind. The applications of 3d printing are endless, and I look forward eagerly to see how this revolutionizes the world. With machines purring all around me as I sat in class, eagerly awaiting the start of the very first Digital Making class, I can’t help but ogle at the finish products on every surface in the classroom. Unlike most classes that I attend at the U of I, this must be one of the most hands-on and interesting class to date. 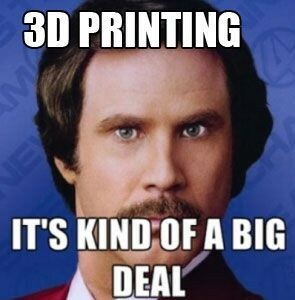 With 3D making, the possibilities are endless. Anything that you can design and create can be made in your own home (or in this class, the Makerlab). That excites me to no end, knowing that by the end of the semester, I would have the skills and knowledge to do exactly that. This week, we had a guest speaker, John Hornick, the author of the book “3D Printing Will Rock the World”. John ran us through the basics of 3D printing, including some of its more interesting uses in the healthcare industry as well as the pros and cons of 3D printing made available to consumers. From John’s lecture, I’ve learnt that 3D printing is a preferred method of prototyping product for startups, due to its high cost benefit ratio, since 3D printing is extremely cost effective, and takes a lot less time to create a product as compared to commercial alternatives. This has led to a huge impact on the manufacturers, since consumers now have the ability to create products instead of having to buy them. John’s lecture has inspired me to look through the internet for cool and interesting uses of 3D printing, and by chance, I stumbled upon this video. Do check out the video if you have time! This week was my first official encounter with the world of 3D printing, and I have to say that it has been a pretty awesome experience so far! However, my first genuine experience with the 3Dp process was back at the end of August, just as the fall semester was beginning. Just some quick background on me for those of you who don’t know, I’m an athlete on the Illinois Wheelchair Track and Road-racing Team. Arielle Rausin, who was a student in Digital Making 2015, is also on the team and found a way to print our racing gloves. Rolling into DRES that day and seeing our gloves being created in a fraction of the time, drove me to pursue this class. Flash forward a few months, and here we are. We started class of with a guest lecture from John Hornick on how 3Dp will rock the world. I had to say, I was a bit skeptical of that claim, but as he went on it was clear where John was coming from. These were the main points that I took away from the presentation. High Cost Benefit Ratio – 3Dp has the ability to create something in a fraction of the time with a fraction of the cost. Going back to the racing glove example cost can be brought down from roughly $350 to $30, with labor times greatly reduced. Accessibility – With the cost of actual hardware constantly getting cheaper and quality getting better, it is now a feasible dream that almost every household will have access to a printer, whether it’s at school, work, or home. Rise of the Makers – This is really a result of the two above points, but with cost and accessibility moving the way they are, so many people can just let their imaginations run wild again. It is possible to create (almost) anything you can think of – you just need the drive, idea, and resources. Can any of my fellow 2016 makers add a comment on something they thought was important from John’s lecture? I think it would be interesting to see what you all have gotten out of it. I truly believe that 3Dp will kickstart a new generation of movers and shakers, one that will only become more robust and refined as time goes on with new advances. I can honestly see amazing things coming out of this new revolution in the industries of healthcare, sport, and even security.